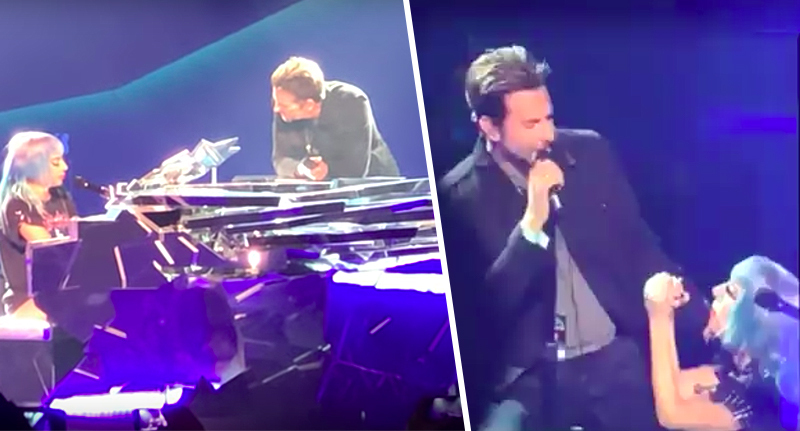 Bradley Cooper made a surprise appearance at Lady Gaga’s Las Vegas show and audiences said it was like a star was born all over again. Gaga is currently performing a run of her Enigma shows in Las Vegas, still riding high after her two Oscar nods for her incredible film debut in A Star Is Born, directed by Bradley Cooper. She’s been really outspoken in her praise for Cooper and his consistent support of her and her work, when no one else would lend her support in Hollywood. The pair have clearly bonded hard over their mutual love of music and collective artistry. So, it was a lovely gesture for Gaga to invite Cooper up on stage with her so he could live out his dream of being a real life rockstar, and not just pretend to be the fictional country rock singer Jackson Maine he portrayed in the remake of A Star Is Born. As soon as Gaga invited her mate on stage, the audience couldn’t contain their excitement. Surely, they knew what was coming? It had to be a rendition of Shallow, the song written by Lady Gaga for A Star Is Born with Mark Ronson, Anthony Rossomando, and Andrew Wyatt. In case you missed it – where have you been? – Shallow is the track which saw Maine invite the struggling artist and the woman he fell in love with in the movie, Ally Campana, as played by Gaga – whose real name is Stefani Joanne Angelina Germanotta – on stage for the first time, sparking a love affair for the ages. This was a lovely little twist on the film narrative to see Gaga invite Cooper onto stage, don’t you think? Shallow has become one of Gaga’s best known songs since the film release last year. It received a Golden Globe for Best Original Song as well as four Grammy Award nominations, including Record of the Year and Song of the Year and a nomination at the Academy Awards for Academy Award for Best Original Song. Beautiful! May Gaga and Cooper be best friends forever, publicly, for us all to enjoy.